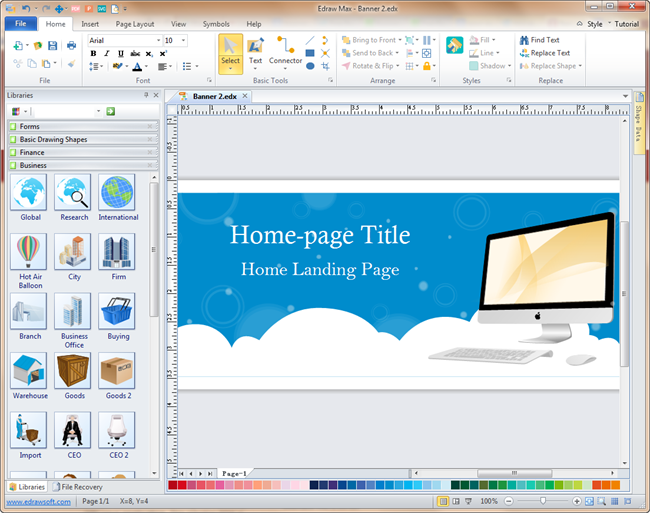 A powerful yet easy-to-use banner software for both experienced and novice users. Help design eye-catching web and advertising banners in just minutes. If you are searching for an effective and easy to use web banner design tool, here is your final stop. Edraw provides the easiest and best way to create and share web banners, much easier than Photoshop does. Extensive ready-made shapes and symbols in the software greatly simplify your design process. By using a Microsoft-alike users interface, anyone could operate, without the need of prior drawing skills. Besides, if you want have a quicker start, customize a ready-made template could be a nice choice. When you finish creating your banner, you can easily export it to PDF, JPG or SVG format, and apply in your webside. Download a free trial and see first-hand how quickly and easily you can create great-looking banner. Choose Presentation category under Available Templates. Double click the icon of Banner in the Templates window. Drag guide lines from the rulers on the left and top sides of the canvas, and construct a general structure with accurate sizes. Then you can design your banner freely through filling color, inserting images and text. An intuitive drag-and-drop interface that's easy to use. Ever-expanding libraries of shapes and templates. Supports to type in personalized text. Edraw includes some banner examples and templates to help you get started instantly. You can open these templates and modify them to meet your requirement. A Christmas banner template is readily available in vector format. Anyone could click to download and save for your own use. Click the picture to have a full view of this business banner template and download it for your own use.